Southwest Florida (District IX) Local Emergency Planning CommitteeProudly PresentsCourse Sponsors:Southwest Florida Local Emergency Planning CommitteeSouthwest Florida Regional Planning CouncilFlorida Division of Emergency ManagementCourse Instructor:The course will be administered by the Ostego Bay Environmental Response Cooperative.Program Description:This 24-hour course satisfies the requirements of O.S.H.A. 29 CFR 1910/120. The course willaddress oil spills in estuaries and coastal environments.  Additionally, it is intended for personnelin industry, the marine regulatory community and the emergency response arena. 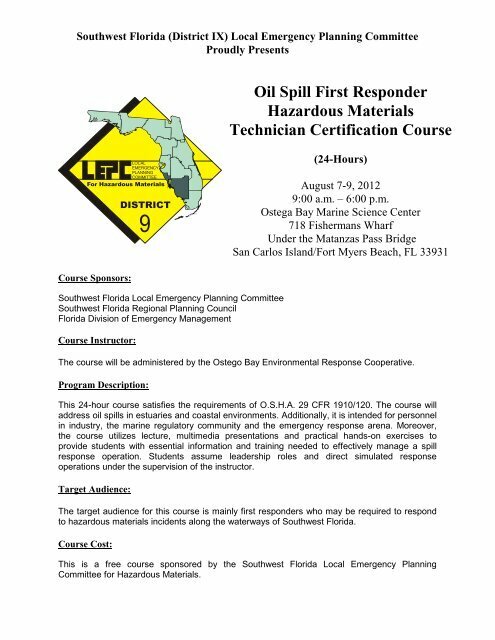 Moreover,the course utilizes lecture, multimedia presentations and practical hands-on exercises toprovide students with essential information and training needed to effectively manage a spillresponse operation. Students assume leadership roles and direct simulated responseoperations under the supervision of the instructor.Target Audience:The target audience for this course is mainly first responders who may be required to respondto hazardous materials incidents along the waterways of Southwest Florida.Course Cost:Oil Spill First ResponderHazardous MaterialsTechnician Certification Course(24-Hours)August 7-9, 20129:00 a.m. – 6:00 p.m.Ostega Bay Marine Science Center718 Fishermans WharfUnder the Matanzas Pass BridgeSan Carlos Island/Fort Myers Beach, FL 33931This is a free course sponsored by the Southwest Florida Local Emergency PlanningCommittee for Hazardous Materials.